Be Part of our Pacific Rim Park family. 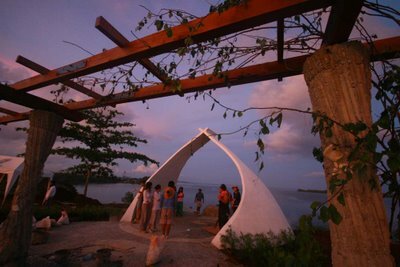 Be a part of Pacific Rim Park by lending your support to our project. We are actively planning for the next park to be built in 2020. Even overlapping mountains cannot prevent a dream from traveling a thousand miles. "I was wondering why I have this fixation on The Pacific. I think the actual moment came when in 1994 we did the first student-built Pacific Rim Park in Vladivostok, then seeing the fascinating ice patterns on the sea off the shores of Siberia; and as a teenager, surfing next to the pier in Del Mar, being startled by a mustached sea lion not 2 feet behind me. Then there was Torrey Pines beach with its golden cliffs, where Anne and I got to know each other. Walking at the edge of the sea, I was curious by what seemed to be a bath tub carved by the Indians. I would like to thank the Kumeyaay people for sharing that magic place with me. In Vladivostok, as we were building another park, the idea came to the students to replace the Ring of Fire, the name given to the circle of volcanoes in the Pacific, and call it a String of Pearls. I then tried to explain to my Russian friends that Vladivostok would greatly benefit by becoming a sister city with San Diego where they could then connect to North America and Latin America in one place. The Pacific is so very big, containing the North and South poles in one sea and a multitude of the wonders of nature and fascinating cultures explored in the beginning by people tuned in with its currents, seeking a new way of life. Today, in much the same way, we are probing the Universe, exploring the strange predicament as to what it means to be human, and trying to learn how to live with and fall in love with billions of galaxies. Then there is this strange growth we have decorated our Pacific with, an island of plastic bags over 300,000 square miles that cries out for help. What if the Pacific were a new culture, different from the Atlantic cultures, a new way of understanding our place in the world? What if the countries and people that live by this grand lake thought of themselves as a family? This almost seems hopelessly naïve, but if we are able to imagine it, it is then possible. Could we be at the door of a culture for the celebration of our gifts and diversity? I believe so: we live in a place unmatched in the diversity of nature, by our overflowing rich cultures and all their unique ways of celebrating life. The parks we’ve created in over 20 years — "Soil & Soul" in Vladivostok, "Pearl of the Pacific" in San Diego, "Entre Corazon Y Mar" in Tijuana, "Salinlahi" in Puerto Princesa, "Stepping Stones to the Pacific" in Jeju, and "Pacific Birth" in Kaohsiung — are our small way of exploring an imaginative vision of a new consciousness waiting to be born. If you doubt what I say, on a warm Sunday evening go sit on the beach under the golden cliffs of Torrey Pines, notice the rainbow of people, watch the surf roll slowly in and the sun dip into an indigo sea on its way to magic islands to wake up our friends in a world we call Asia. This is their backyard too. The Pacific, ocean of peace, is large enough to hold all our love and caring." In 1994, the Pacific Rim Park (PRP) and Ilan-Lael Foundation (ILF), under the artistic direction of artist James Hubbell, launched a global conversation between San Diego and Pacific Rim nations around the transformative power of art and the artistic process. 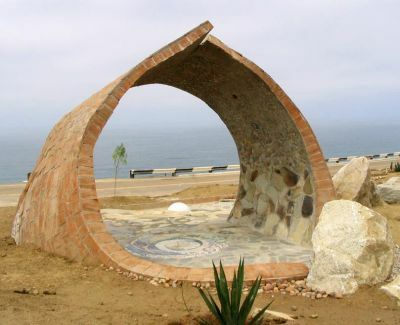 Hubbell’s unique expression of art diplomacy resulted in public art parks built by an international contingent of architecture students in seven Pacific Rim cities. Through these shared art-making experiences, the diverse people and nations of the Pacific transcended language barriers and cultural differences to explore and celebrate their common humanity.